Aligns with the Government of Alberta’s commitment to having a competent and valued Health Care Aide workforce that provides care to Albertans. The HCA attainment of core competencies reflects the fulfillment of skills necessary to successfully work as an HCA in Alberta. As an employer you have a key role in verifying the attainment of core competencies of your HCA workforce. As an Employer, you are required to provide verification of the core competency status of HCAs you employ. 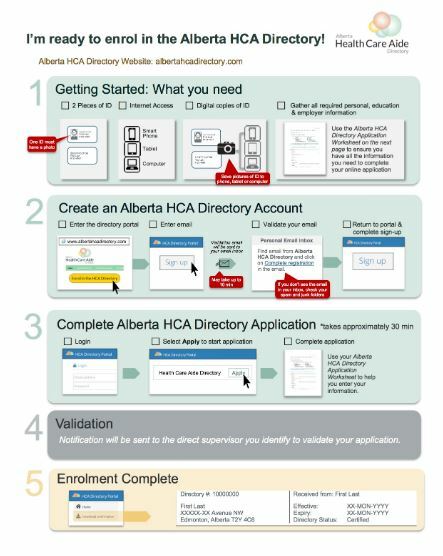 HCAs will enrol in the Alberta Health Care Aide Directory. This will become a condition of employment. Employers will ensure existing HCAs have enroled on the Directory and that new employees become enroled on the Directory by December 31, 2019. The HCA will provide the name and email address of their current supervisor whom they want to validate their core competency status as part of the enrolment process. The goal is to have HCAs competency status transferable from employer to employer, although employers retain the right and responsibility to ensure employees are competent. 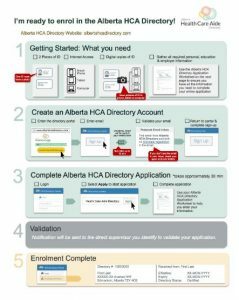 For further information and assistance with the Alberta Health Care Aide Directory, we have developed Toolkits and Videos.